27.09.1946 Returned to R.A.F. 01.10.1946. 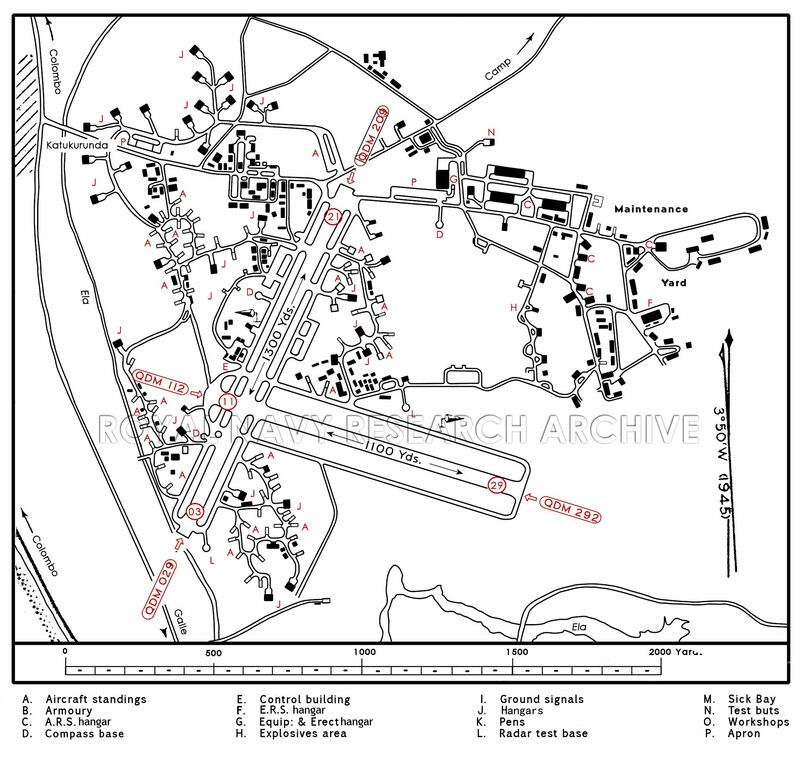 Accommodation for three 24-aircraft and one 21-aircraft squadrons. Limited Reserve Aircraft Storage. 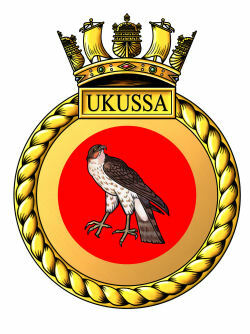 Fleet Requirements Unit (797 squadron). Naval Air Radio Maintenance Group (East Indies Station). British & American Torpedo facillities. The airfield lies within 600 yds. of the SW. coast of Ceylon and adjacent ESE. 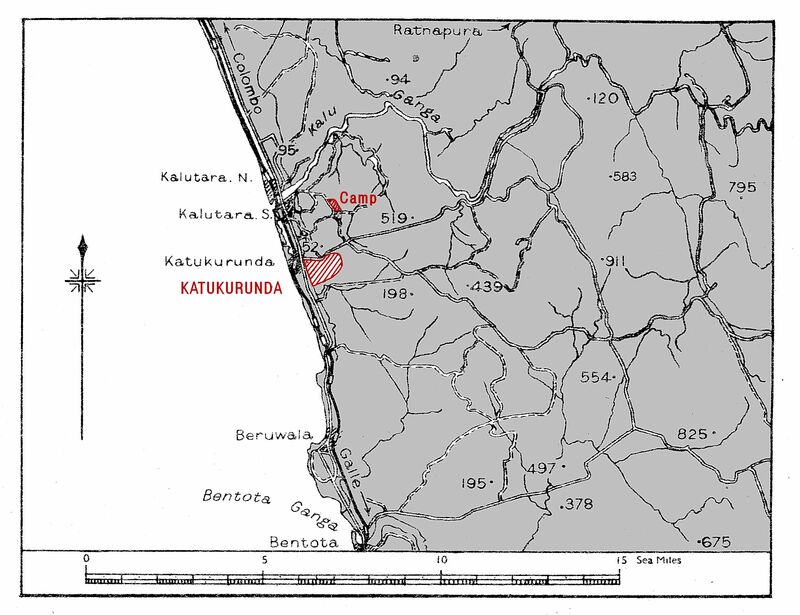 of Katukurunda, a village on the S. shore of Kalutara lagoon. Kalutara South lies 2 miles NNW. and 22 miles NNW. The town and harbour of Colombo. 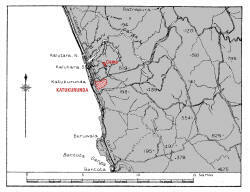 The Kalu Ganga flowing in a SW. airection to enter the sea between Kalutsra North .nd Kalutsra South; the main coastal road and railway to Colombo bridges the river's mouth. A conspicuous road from Katukurunda passes the NE. end of runway 03/21. Access to the main Colombo - Calle coastal road. Railway station at Katukurunda, n the Colombo - Calle -line. Control Building W. of 03/21 runway, close N. of runway intersection. 03/21 QDM. 029° -209° .... 1,300 x 50 yds. 11/29 QDM. 112° -292° .... 1,100 x 50 yds. 45' tarmac taxying strip run along each side of the runways, connected by 30' taxi tracks to hangars, workshop, and dispersal areas. Hill (519’) distant 2½ miles ENE. Under conditions of no-wind, best approach is QDM. 209°. Windsock near the centre on W. aide of runway 03/21. H/F (reduced to C. & M.) and VH/F. Fighter Direction using G.C.I. and Interrogator, and Fighter Direction using low outer Radar set with Interrogator. Living accommodation at Camp, 2 miles (R) NE. of the airfield. Four, 2 of 70' and 2 of 50' diameter respectively. 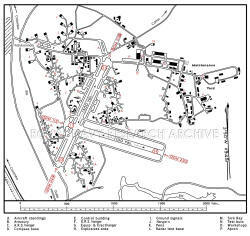 59 single aircraft pens with Kadjan roofs, and 17 with asbestos roofs, in four area situated on either aide 07/21. Four aprons, two for fuelling situated on either side of runway 03/21, and two for parking near its N. end. Squadron hangars in dispersal areas on either side of runway 03/21. Storage hangars on NW. aide of airfield. Note. Maintenance Yard hangars are not included. Sick Quarters close W. of Camp. Sick Bay in Camp. Sick Bay at airfield on S. aide of runway 03/21. Office in Control Building; full service by naval personnel. 52,000 gallons in three installations. Further installation for 18,000 gallons under construction. 1,000 gallon. Aeroshell 100; 1,000 gallons Aeroshell 120. Parking space and hangar in No. 1 dispersal area, opposite the Control building. On E. side of the airfield adjacent to the W. side of the Maintenance Yard. Taxi tracks connect to the '21' end of runway 3/21 and the centre of 11/29. Note. Dive and Practice bombing range under construction.